As a busy adult, I often joke that I’d be lucky to pick my neighbors out of a police lineup… and I’m not alone. Although one of the reasons for this phenomenon could be attributed to the way that America’s celebrity driven media redirects our attention towards those who live hundreds of miles instead of dozens of footsteps away, all I know is that when I was younger, nobody was worthier of my childhood interest (and inquisition) than my neighbors… and I’m not alone. Scout was frightened yet fascinated by her mysterious neighbor Boo Radley in To Kill a Mockingbird and despite the intentions of young Dennis to befriend rather than antagonize his cantankerous next-door neighbor Mr. Wilson, he turned into quite a likable Menace in the brightly colored newspaper comic strip. 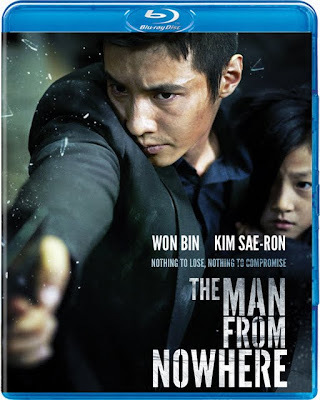 While admittedly South Korean filmmaker Lee Jeong-Beom's recently released gritty crime thriller has far more in common with Luc Besson's Leon aka The Professional – minus the romantic subtext – than Dennis the Menace , there's no denying the Boo Radley air of mystery surrounding the handsome, brooding, enigmatic nameless Man from Nowhere played by Won Bin (Mother ). Having closed himself off to the world after a horrific tragedy that we gradually discover alongside law enforcement officials that cut corners to unlock Mister’s government file and piece together his extraordinary past as a special agent, Won Bin’s “ghost” puts his life on the line to rescue the girl who relies upon him like a surrogate father. While there are far too many characters – and alliances between them including factions of villains and even more double-crossers – than we can possibly keep straight on an initial solo viewing without the Blu-ray advantage of jumping in and out of scenes to double-check our logic, all-in-all it’s a highly entertaining entry into the man-on-a-mission for vengeance genre. An extremely dark thriller that takes a sharp left turn from the underworld drug scene into the ruthless black market human organ donation trade, The Man from Nowhere grows overly gruesome as it continues when far too much time is spent on do-it-yourself surgery and disemboweled bodies. While the gore may have been more readily forgiven if it was in the name of a martial arts showdown as evidenced in an epic knife fight that brings you right into the action – dodging your head to and fro thanks to inventive helmet-camera cinematography – Won Bin’s moving portrayal will keep some squeamish viewers from pressing eject. From fast-paced action scenes utilizing Filipino Kali and Southeastern martial arts to an emotionally powerful character arc and storyline, writer/director Lee Jeong-Beom and his incredibly talented cast and crew ensure everything not only clicks in place as South Korea’s highest-grossing picture of 2010 but also leaves an impression as a highly effective, no-nonsense work of contemporary Film Noir. While it’s safe to say that Won Bin’s exceptionally photogenic face is one you’ll remember in a lineup, if you manage not to drown in the pools of blood and the sea of characters and focus instead on the opus taken by “the man from nowhere,” you’re sure to appreciate the Boo Radley reminder that sometimes the most interesting people can be found right next door.